‘Caley’ Sleeper Mk5s make London debut, Vintage Trains to expand railtour operations, Class 50 Alliance teamsup with GB Railfreight, TfL shortens ‘378s’ for GOBLIN stand-in role, Island Line decision deferred, East Lancs heritage operations threatened by commuter andtram-train proposals. March launch for Wightwick Hall, ‘Scotsman’ to be reunited with US tour observation car, Caledonian tank for Churnet Valley gala, Barrow Hill to buy MR ‘Half Cab’. Network Rail hails successful Christmas engineering programme, Norfolk swing bridges to be replaced?, faster and drier through Sevenoaks Tunnel, £19m transport hub opens at Newton-le-Willows. 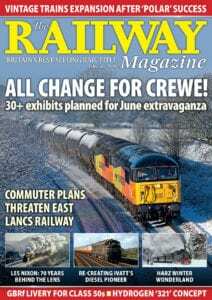 INSET 2: Saving a piece of the GCR – 50 years on. INSET 3: Re-creating Britain’s first main line diesel loco. Nick Pigott interviews one of Britain’s best, and most prolific railway photographers, still contributing to railway publications seven decades after taking his first shot in 1949. John Heaton recalls coal consumption trials undertaken by the LMS in 1931, comparing a lightweight M&GN 4-4-0T with a larger Johnson 0-4-4T in a bid to assess whether trains of lower overall weight could cut costs on lesser used lines. 50 years ago, the first seeds were sown in a bid to save a section of the Great Central Railway in Leicestershire. Graham Oliver, the railway’s former chief executive, recalls the early days of what would become the country’s only double-track main line preserved railway. Robert Drysdale describes his 800-mile trip when he visited four heritage railways in four days using the national network and occasionally a local bus. The scrapping of Britain’s first main line diesel locomotive in the 1960s left a missing link in the story of modern traction which the Ivatt Diesel Re-creation Society is working to fill.